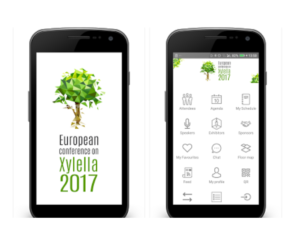 A mobile app for the “European conference on Xylella fastidiosa: finding answers to a global problem” is now available for free on Google Play and Apple Store. A major scientific conference on European research into Xylella fastidiosa is to be held in Palma de Mallorca, Spain, from 13-15 November 2017. The conference is being organised jointly by EFSA, the University of the Balearic Islands, the Euphresco network for phytosanitary research coordination and funding, the EU Horizon 2020 projects POnTE and XF-ACTORS, and the European Commission’s Directorate-General for Research and Innovation (DG RTD). The event will provide a platform for in-depth discussion on the results of research into X. fastidiosa and its vectors, in support of on-going efforts to control the European outbreaks. As well as speakers and participants from Europe, the conference will be attended by scientific experts from other parts of the world – such as Brazil and the United States – where X. fastidiosa has been present for many years. For full program and practical info of the conference, click here.